I came across this new yarn by Lion Brand (Vanna's Glamour) - it is a fine yarn with sparkling specks throughout the yarn, so I picked up 2 skeins (no self control, lol) and decided to knit a scarf. I used a 10-1/2" straight needle and used a seed stitch. 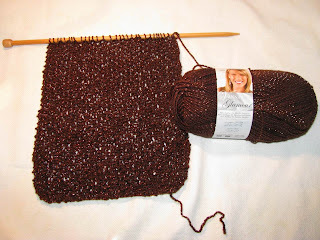 I wanted the scarf to have a slight airy look yet not too airy and I also didnt want a tight stitch. I have to say the pictures dont do this yarn any justice. It is beautiful. 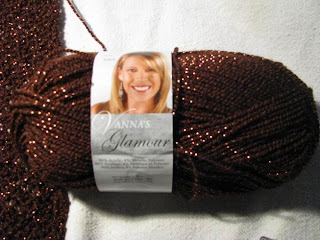 My color choice was copper with bronze shiny specks. Will be really pretty for the holidays. Here we are, end of August, the holidays just a blink away. So I decided to start some gifts ahead of time. It looks really nice. What do you think? It has been sooooo hot here the last few days there is no energy to do anything let alone knit. The scarf slowly coming along. I will post a picture when I am done.